South Carolina College was chartered in 1801 and opened in 1805 as the state’s first venture into public higher education. At that time, some American universities had begun professorships of law, but law schools did not yet exist as separate departments. Harvard formed a law school in 1817, but the apprentice system continued to be the principal method of educating attorneys. A professorship of law was first authorized in 1820 at Carolina but was not implemented until 1867. By this time, there were only 30 law schools in the United States. Alexander Cheves Haskell, Carolina’s first professor of law, held his first class on October 7, 1867, in what is now the South Caroliniana Library. The class of two students graduated in June 1868. Haskell resigned in November to become a judge, and the law program remained closed for the remainder of that academic year. From 1873 to 1877, South Carolina College was the only southern state university to admit and grant degrees to African-American students. Eleven African Americans are known to have graduated with law degrees between 1874 and 1877. The first was Walter Raleigh Jones. Another, Richard T. Greener, was also the first African-American faculty member at the university. In 1877, Carolina closed, reopening in 1880 as a segregated school. It would remain so until 1964. The School of Law’s future steadied in 1884 with the appointment of Col. Joseph Daniel Pope to the professorship of law. Pope had read law under James L. Petigru and from 1884 to 1900, he taught the entire law curriculum. Under his influence, the School of Law was recognized in 1891 as a separate department and was moved from the library to the first floor of Legare College. During this period, admission standards for the law school were almost identical to those for incoming freshmen, the only difference being the age requirement. Law school applicants had to be at least 19, while college freshmen could enroll as young as 15.
both the size and composition of its student body. In 1900, Pope was named the first dean of the School of Law, and by 1906, the law faculty had grown to three. Enrollment increased from 32 students in 1907 to 75 students in 1917. It was during this time that the course of study was expanded to two years, and the case method of teaching was adopted. A century later, it continues to be the most prevalent style of legal classroom education. Claudia James Sullivan became the first female graduate of the School of Law in 1918, but despite her groundbreaking achievement, women remained very much the exception for nearly another half century. In 1919, Petigru College (now Currell College) became the first separate law school, built at a cost of $40,000. In 1923, the School of Law required all applicants to have completed at least one year of college. 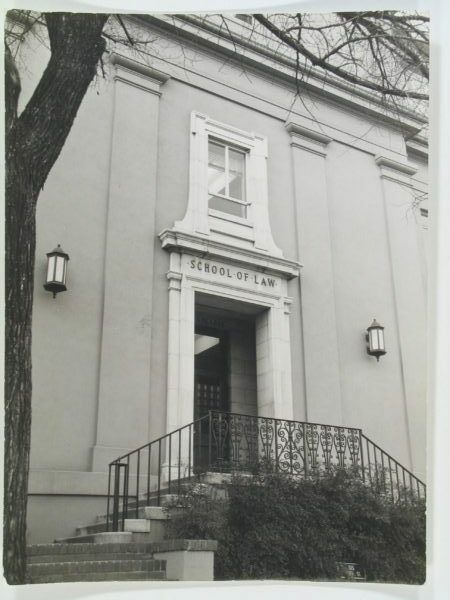 In 1924, the School of Law, its faculty now numbering six, was accepted as a member of the Association of American Law Schools and in 1925 was accredited by the American Bar Association. That same year, the admission requirement was raised to completion of two years of college, and the curriculum was expanded to a full three-year course. Two prestigious student organizations, which continue today, had their origins in the School of Law in the 1930s. In 1935, two students created the Order of the Wig and Robe, initially honoring seven seniors and five juniors who had attained the highest academic averages. Today, the Order continues to recognize the top second-year and third-year law students. the legal profession among law students.” Over time, it evolved into a more traditional academic journal, becoming the South Carolina Law Quarterly in 1948 and the South Carolina Law Review in 1962. In 1938, the School of Law ushered in the birth of experiential learning, creating the nation’s first practice court program under Judge Marcellus Whaley, a professor at the school from 1937 to 1950. In 1940, Sarah Leverette entered the law school as one of only three female students. She was the only one to graduate and went on to become the school’s first female faculty member. In 1946, an African American named John H. Wrighten applied for, and was denied, admission to the School of Law. He sued the university, and in Wrighten v. Board of Trustees of University of South Carolina, the U.S. District Court ordered that the state either admit African Americans to the University of South Carolina School of Law or to another school with equal facilities or not operate a law school at all. Subsequently, a law school was opened for non-white students at South Carolina State College. It was closed in 1966, just three years after Carolina re-integrated following nearly 100 years of segregation. In June 1967, Jasper Cureton, later a judge on the S.C. Court of Appeals, became the first African-American graduate of the School of Law since Reconstruction. In 2004, Burnele V. Powell became the first African American to serve as dean of the School of Law; in 2017, Chelsea Evans was named the first African-American editor-in-chief of the South Carolina Law Review; and 20 percent of the entering class in fall 2017 were minority students. At a cost of $250,000, the second Petigru College opened in 1950 and featured such modern amenities as a practice court, cubicles in which students could type without disturbing others, and a library large enough to hold its 40,000 volumes. In 1953, air conditioning was added. Law Center at 701 Main Street was dedicated in 1974, with Lewis F. Powell Jr., associate justice of the U.S. Supreme Court, and Vice President Gerald R. Ford as featured speakers. Unfortunately, the $5.9 million building didn’t anticipate the sweeping changes that would soon be coming, and many amenities were noticeably absent, including technological capacity and women’s bathrooms. The computer revolution was still some ways off, but it was during the 1970s that women finally began to constitute a significant percentage of the law student population, growing from only a handful in the Class of 1970 to nearly 50 women in the Class of 1980. The entering class in fall 2017 was 46 percent female. had not been anticipated, leaving less than adequate space over the next 40 years for a program that operates much like a law firm. Now, during a time when experiential learning is receiving new emphasis nationally, the School of Law clinics enjoy a far more appropriate space with more than 4,600 square feet of offices, work areas and interview rooms. During the 1980s, the School of Law began one of its most cherished traditions, the outdoor graduation on the Horseshoe. It was also awarded a chapter in the Order of the Coif. Pamela D. Robinson. And in 1995, the Children’s Law Center was created to promote policies in the best interests of children, and provide continuous child protection advocacy training for the state’s legal community. in 2004 and the Konduros Leadership Program developed in 2015. With more than 50 full-time faculty, students can choose from more than 100 upper-level courses, 12 dual-degree programs, and a variety of experiential learning opportunities, including clinics, externships and capstone courses. New faculty have been strategically hired to strengthen specialty law areas including health law, law and technology, small business practice, environmental law and children’s law. celebrate all of this along with our new building, which opened this summer. Indeed, the School of Law has transformed itself into a living educational space. But more importantly, it will continue to lead the way in which legal education is taught in our state and in our nation for the next 150 years.